Learn the tips, tricks, and secrets of creating an endless array of adventurous quilt designs inspired by your favourite photos with this practical and easy to follow guide. 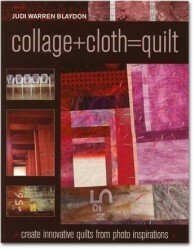 Packed with simple instructions and full-colour illustrations, Collage+Cloth=Quilt teaches readers how to transform their photography into inspired quilts that speak to the soul. This volume also includes expert advice on how to look for texture, shape and colour when you take photos; how to spot unusual vantage points and intricate details; and how to select fabrics that will give your composition the best possible results.